Here's a nice view of Mt. Hood Railroad locomotive #1 from September, 1949. It was helping remove a derailed car which had landed on the Powerdale pipeline. We saw the cleanup operation here. Smoke, steam, and fire with seeming unlimited clanking and rumbling, must have been some great times..
A big jolt to a small railroad, loss of income from traffic, repair the right of way, the track, the pipeline, the rail cars, and rental of the main lines crane with a crew to work it. and times we keep alive....coming up on our last weekend of Holiday Express runs out of Oaks Park in Sellwood on the Oregon Pacific Railroad. This year the HE is being pulled by the SP 4449 steam locomotive. All runs are sold out but trackside viewing on the Springwater Trail is free and close. Thanks Arthur for this early Christmas present. If you take the Mt Hood Railroad trip now, can you see where this is taking place? 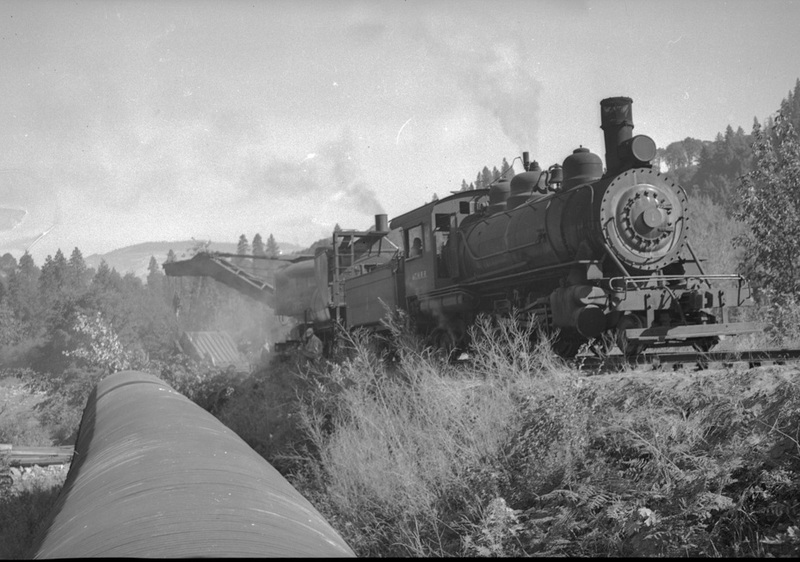 LE, yes, note the relationship of the RR to the pipe and the view of the hills on the right and left in the distance.